My name is Bill Held, Jr., and I live in Newark, Delaware (yes, Delaware is its own state - not some township in Pennsylvania!). Been hooked on old Fords since birth (still have the same '66 Mustang I had in high school - although in high school it was a stocker, now it's hopped up a little!). 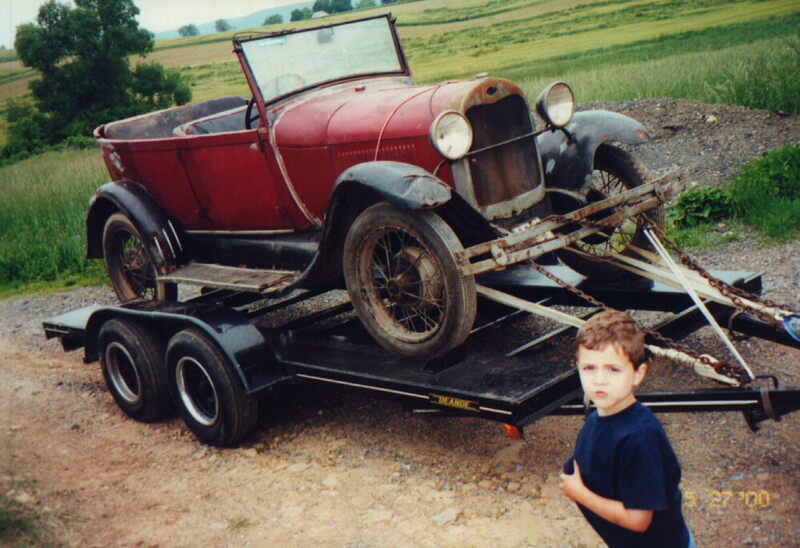 Although my past projects had been mainly with cars from the 60's, I've always had a sentimental spot for Model A's. 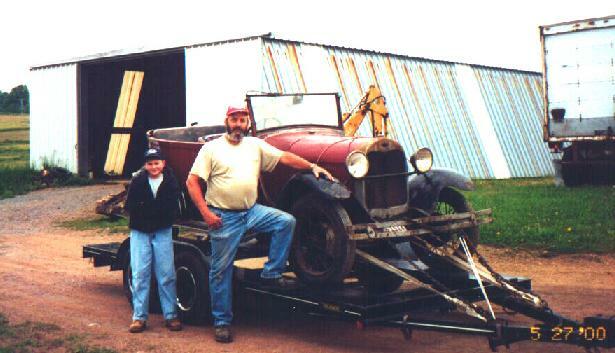 Found a great old picture some time ago of my late Uncle Woody and Aunt Chet (now in her 80's) proudly standing next to their 1930 Model A Tudor. I always thought it was a cool picture and a neat old car. More recently, a buddy of mine, Mark Warrington (equally spun-out on old Fords), got me even more interested in Model A's after he bought a schweeet '28 roadster p/u from the great Southwest. Brought a trailer up a few weekends later with my Dad and son. 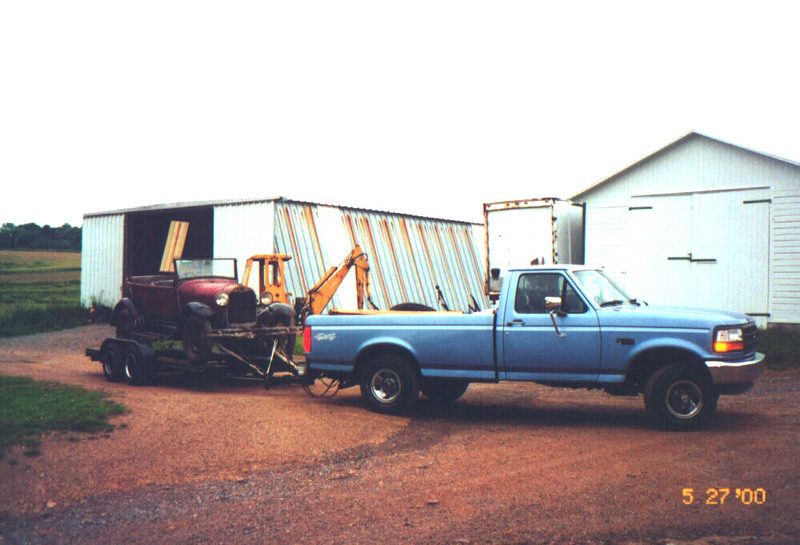 We were able to drive it around a bit before getting it loaded on the trailer. We couldn't go too far - the radiator leaked and the gas tank was full of crud. You can't tell from the picture, but we were grinning from ear to ear the whole time! I'll tell you what, it's tough the first time shifting with your left hand. Not only that, but the accelerator pedal on this RHD car sits in between the clutch and the brake pedals (perhaps all RHD cars do? ), so you've got to pay attention to what you're doing! Despite the dirty windshield, we didn't run over anything! It was owned by a farmer, Bill Clark (seen at left), who lives near Reading, Pennsylvania. Mr. Clark bought it from the family of Dale and Joan Slaght in 1982, who had imported it into the U.S.A. in 1979 from Uruguay, where Mr. Slaght had worked at the U.S. Embassy (he most recently works for the US Department of Commerce in Mexico). A local antique clock repairman had the car for sale (local meaning Durazno, Uruguay! 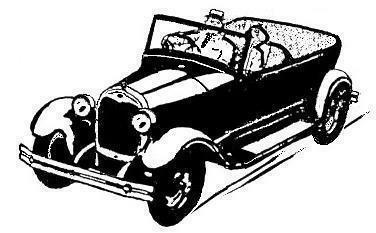 ), and the Slaght's traded $600 worth a stereo equipment for the Cachila (pronounced "cah-CHEE-lah"), or antique car. When they moved to Uruguay, the government paid to ship their car there (a Ford Granada). They sold the Granada in Uruguay before moving back to the US, and the government paid to bring their car back (which happened to be this Model A). They brought the A back for Joan's father to restore, as he had been a Ford mechanic and had learned to drive on a similar car. Turns out he wasn't interested, and Joan's mom sold the car to Bill Clark. Mr. Clark said he decided to sell it 'cause his son was into old tractors, and he didn't want to part out the ole phaeton as some local Model A guys suggested (I did say the car is rough, right?). So he had his daughter list it for sale on the internet. I've been asked why I refer to it as a "1928/1929". Well, it was built in September 1928, and it has no outside door handles (a '28 only clue). However, the car is titled as a 1929, and DMV doesn't respond well to change. 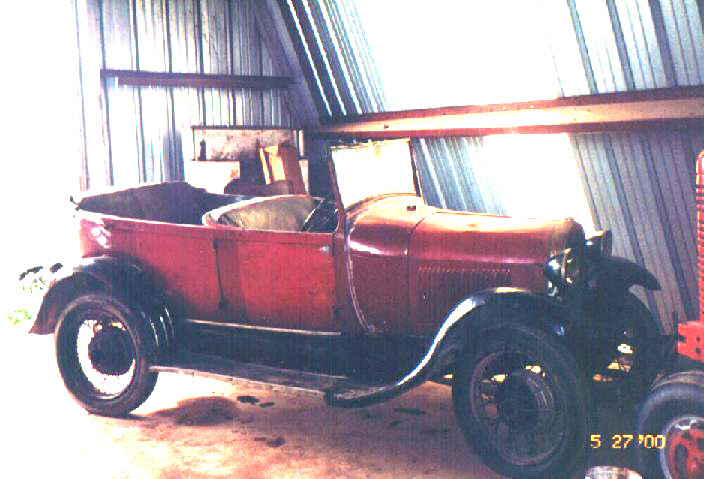 The Slaght's paperwork from Uruguay lists the car as a 1929 model, and the U.S. paperwork carried over from that. So it's a '29 in name only, which isn't necessarily incorrect. I've been told that often a new car was titled/registered as the same year in which it was sold (plus ol' Henry was notorious for using up left-over parts). Once on the trailer, we took it home for a short disassembly. The required parts were sourced, which included: new exhaust, radiator, exhaust manifold, a new Sears Die Hard (a 6V tractor battery! ), and a whole lot of little parts (boy it adds up quick!). The gas tank was cleaned, sealed, and repainted. Got it running again on a warm day at the end of January 2001. Getting it running does not equal getting it tagged. There's alot to do before that'll happen. 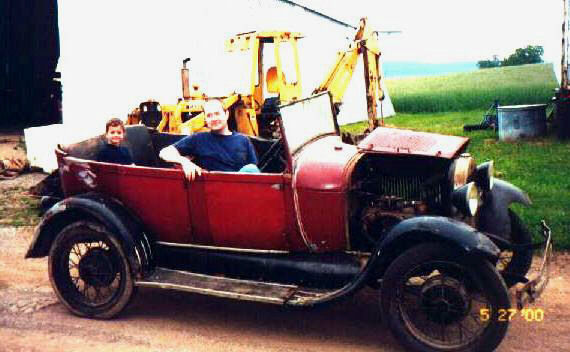 Even still, Jack & I took it for a spin around the block on Memorial Day 2001 (with no quick stops!). Although the purists will cringe (some have already), I plan to hop it up a little - No, I'm not planning to build a "350-350-9"-MustangII street rod" (can't see messing up an old Ford with a "Built-From-Billet" Chevy motor). Even the term "Nostalgia Rod" (now so trendy) doesn't exactly describe my plans for the car. There seems to be some vintage speed equipment still available for these little four banger motors, so why drop in a flathead? I joined the Secrets of Speed Society, to learn about the ancient ways of getting more out of these old cars. For now, priority #1 - making it safe (so I can get it tagged), followed by making it more reliable (and yes, hop it up a little! ), then maybe someday I'll get to the cosmetics. My goal is to make it a runner, rather than a fine show car that you're afraid to drive (had a show car once, but it wasn't nearly as much fun as my hopped up daily ride!). 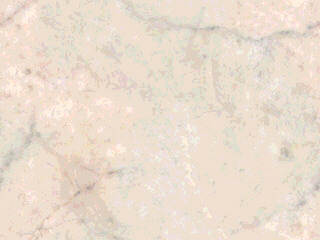 In fact, this one rough Model A (that was considered too far gone by some) has already proven to be a lot of fun. Like working on a puzzle, it is very satisfying when I overcome each setback during the process (after the initial utterances are made - "Oh #%&@!"). There's truly something special about working on a vintage piece of iron that's this old. If you've stumbled across this web page, I bet you already know what I mean - if not, I highly recommend that you go get yourself an A! Last updated June 8, 2006.